Charm’s mission is to return the atmosphere to 280 ppm CO2 profitably. We’re starting by producing industrial hydrogen from biomass. Industrial hydrogen, a $120B/year market that represents 2% of global CO2 emissions, is typically produced via steam methane reformation. Our method for producing hydrogen is biomass gasification: you heat up biomass to 1000°C without oxygen and it vaporizes into a gas stream that can be purified into carbon-neutral hydrogen. With the addition of geological carbon dioxide sequestration it becomes carbon-negative. In short: the hydrogen pays for sequestering the carbon dioxide and helping return the atmosphere to pre-industrial CO2 levels. You’d think that loading grass would be easy. We sure thought so. But grass hates to flow. Even when chopped into tiny pieces it’s a pillowy, stringy, grippy mess that has an angle of repose over 90°. Naively, we assumed that grass would flow somewhat like an ideal fluid, allowing us to use a simple, funnel-like hopper. We’d just attach the hopper to the gasifier input and dump in grass. 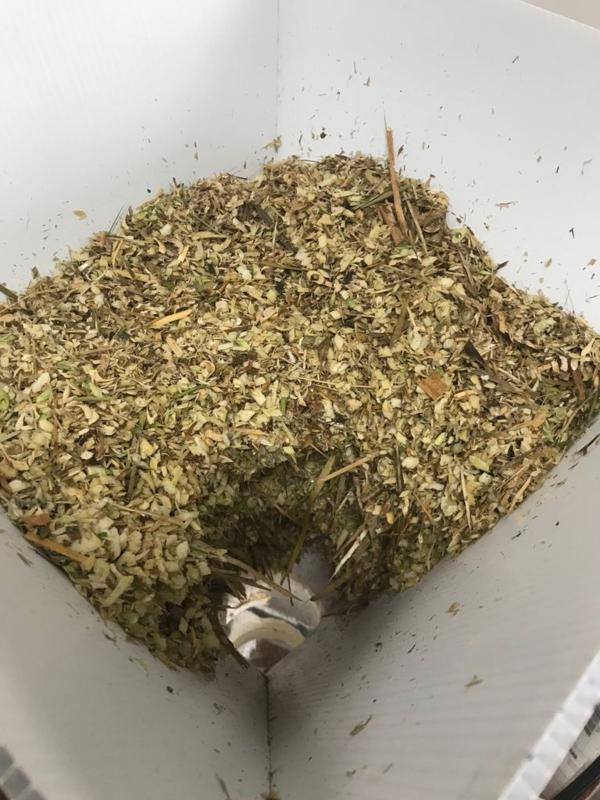 Obviously the grass would flow out of the hopper and into the gasifier — where else could it go? Our first hopper had a 60° cone angle (the slope of the walls, measured from horizontal), which is aggressive for an ideal fluid but common for solid flow applications. 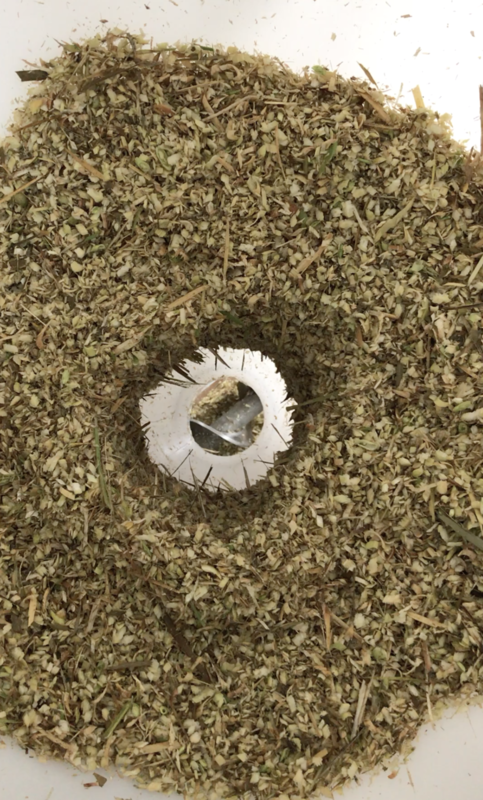 To test it, we threw in some chopped grass… and it just sat there. Obviously we just needed a steeper cone angle, so we fabricated one at 75° but it still jammed. Perplexed, we increased the angle to 82.5°—practically a straight pipe—and it still jammed. Thus began our surprise introduction to the field of bulk material handling, where entire books have been written and companies have been founded solely to solve this issue known as ‘bridging’, and the frequently-associated ‘hammer rash’. Clearly a simple funnel was not going to cut it. We were going to need some mechanical motivation to loosen up the grass and prevent bridging. Our first pass on the literature suggested we could use an auger to push material down and out of the funnel. Unfortunately, it turns out this just compresses the grass at the outlet which makes it even more likely to bridge and jam. Counterintuitively, you need to decrease the density of grass in the convergent section of the funnel in order to eliminate bridging. So we reversed the auger to pull grass away from the funnel outlet. This worked quite well for a while to prevent bridging, but also introduced a new problem: a “rat hole” of empty space around the auger, with grass stacked up the wall of the funnel. An auger wasn’t going to cut it. So it was back to the bulk-material-handling research papers for an alternative solution. After reading a few dozen papers we saw repeated mentions of a concept called a “rotary plow hopper.” Rotary plow hoppers have a large circular bin with a plow mounted at the bottom that pushes material into a smaller hole at the center of the bin. These are often used for feeding difficult materials such as coal. Our first rotary plow prototype didn’t work, with grass getting compressed and clogging the outlet hole. Undeterred, we used our 3D printer to iterate through a new geometry for the plow every 48 hours, and amped up the plow torque with an additional gearbox. Ultimately, every iteration produced the same result: the plow swept grass toward the center outlet, but rather than flowing nicely the grass was compressed and formed into a dense plug, completely jamming the system. Our attempts to increase the motor torque and push through the grass plug just resulted in a denser, more tenacious plug. Even though rotary plow hoppers work well for shoving through tough materials like coal, the compressibility of grass means that more gentle methods of persuasion are required. By now the rest of the initial gasification system was ready for testing, but we still had no way to actually feed it grass. This was supposed to be the easy part! We dove into the research on solid flow handling again, this time on Youtube instead of Semantic Scholar, and discovered bin activators. 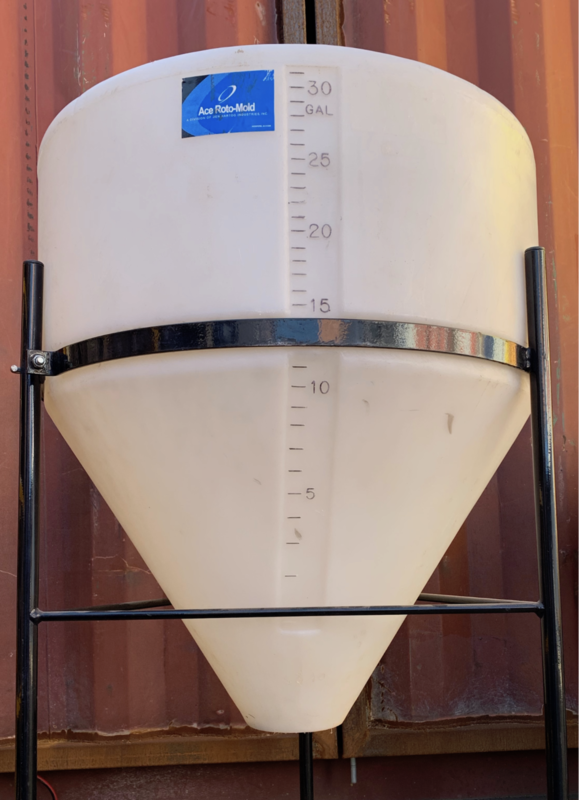 Bin activators have an internal baffle mounted above a funnel-like outlet with a small annular gap between (it’s a mouthful, just look at the picture below.) When first loaded, the material forms a bridge in the gap between the baffle and funnel. Then, an attached motor vibrates the assembly. This effectively fluidizes the stagnant material, allowing a controllable amount to freely flow through the annulus and into the funnel. In a rush to try something quickly, we found a bin activator of roughly the right size on eBay and had the 600 lb monster shipped across the country on a pallet. We inexpertly chopped it down to a reasonable size, replaced the dead vibration motor, and added some explosion vents. We loaded grass into it, and the expected bridge formed around the annulus between baffle and funnel. Then—the moment of truth—we activated the motor, and the grass flowed! ...most of the time. Periodically we’d still see stubborn blockages. However, we discovered that moving to a different vibration frequency would reliably unblock the grass plug. Success at last! Finally in command of our troubling feedstock, we were ready to load grass into our gasifier. However, the grass flow rate was still not predictable or steady. For testing purposes we wanted a steady stream of grass entering our system, but instead we were getting bursty lumps of grass. To bring closed loop control to the system and load grass at a continuous and controllable rate, we needed a flow rate sensor. So, after considering several different ideas including weight sensors, we settled on a microwave doppler sensor that would point down the outlet pipe. We correlated the strength of the microwave doppler signal with known mass flow rates. 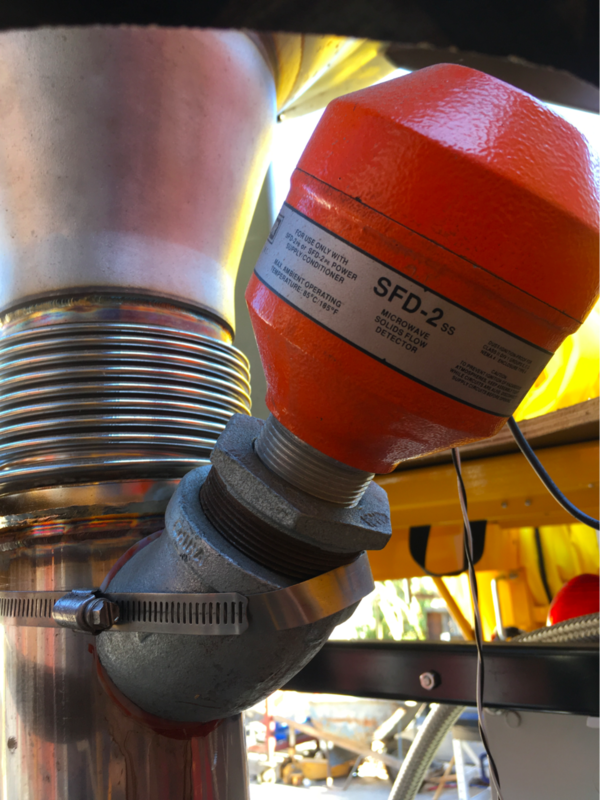 This gave us a real-time estimator for grass flow rates into the gasifier, allowing the system to maintain a consistent flow rate and also automatically sweep the vibration frequency to unblock the occasional jam. All in, this setup worked well for 20 hours of gasifier testing throughout the fall. The system can definitely get better: the microwave doppler sensor is very sensitive to grass moisture content, and wet grass occasionally builds up and obstructs the sensor’s viewport. But for now, we’ve moved on to other challenges with heating, scrubbing and tar reforming. If eliminating humanity’s CO2 emissions while solving hard mechanical, chemical and electrical engineering problems sounds fun to you, we’re hiring and we’d love to hear from you!